How To Save Money On Your grocery Budget! Hello everyone! Today I thought I would share with you how I save money on my grocery budget. First of all I am no chef and all of my meals are very basic. We live on one income and are a family of five. Might I add that my son who is fourteen eats as much if not more than his dad. Then there is myself and my two girls eleven and seven who don't eat as much. In our house hold one way I save money is that I never buy soda, cookies, or chips on a regular basis those are special items for birthdays. When I shop I always by staples such as rice,beans,flour,sugar,potatoes etc. I feel that with these main ingredients on hand I always have something to make. Even if it is just rice and beans! We love using the Dave Ramsay Envelope system and I always pull out cash for groceries and yes I shop with a Calculator! It can be time consuming but in the end I feel better when I get up to the counter to check out. We set a budget of 550 to 600 dollars a month that includes food and household items such as toilet paper, laundry soap and napkins. The number one life saver for saving on food is to make a menu plan. 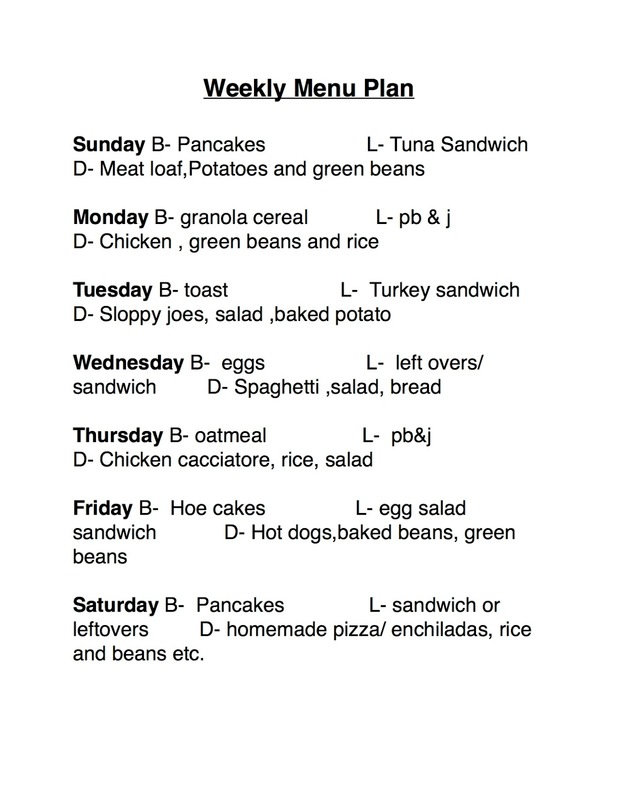 I shop bi-weekly when we get paid and and go off of a menu plan. I typically make a lot of stuff from scratch so the only snack food we purchase are fruit strips and all natural fig bars and I get those from Costco. We tend to eat eggs from our chickens , toast or oatmeal for breakfast and I have been making granola cereal which saves a ton on not buying the pre-made cereal. For Lunch we have sandwiches or left overs and a fig bar or fruit strip. I make a different meal every night of the week which consist of a meat,a starch and veggies. I then rotate them for two weeks. We also save money by not going out to eat. 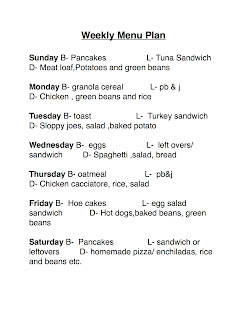 Here is my menu plan for one week. Like I said nothing fancy around these parts, but at least are bellies are full!